Seiko has long been a mainstay in the world of diving watches. Many innovations can be attributed to the Japanese manufacturer. Its catalog features an entire line of diving watches. 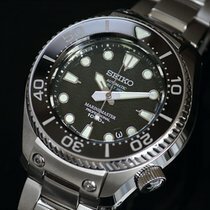 Both professional and hobby divers can find a perfect Seiko watch. Diving watches are classified as any watch with water resistance of at least 200 m (20 bar). They have been an integral part of the Seiko catalog since 1965. The Japanese watchmaker has been continually improving on their dive watches with new and innovative developments since the 60s. It was Seiko engineers who first made a diving watch with a double titanium case. The so-called "accordion" band is another Seiko innovation and makes sure that the watch stays securely on your wrist, whether on land or in the high-pressure environment of the deep sea. Seiko put the performance of their diving watches to the test in September 2014. Multiple Marinemaster Professional 1000m watches survived unscathed at depths of 3000 m while attached to the hull of the Kaiko 7000 II research submarine. 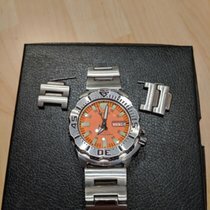 How much does a Seiko diving watch cost? Top models come from the Grand Seiko line, as is true of most Seiko top models. The king among Seiko's diving watches is the Grand Seiko Hi-Beat 36000 Professional Diver's 600m with reference number SBGH255. This watch is top of the line when it comes to its features and workmanship and can proudly stand beside Swiss competition such as the Rolex Sea Dweller. The high intensity titanium case with a diameter of 46.9 mm and a height of 17 mm shows that Seiko means business with this watch. In addition, the unidirectional bezel with its highly legible 60-minute scale and the large hands and indices give the watch its character. Thanks to a layer of LumiBrite, this watch is easy to read even in deep waters. The black dial is made of iron, which protects the watch from magnetic fields of up to 16,000 A/m. You won't find a helium escape valve on this watch, though it is water resistant to 600 m. Seiko's L-shaped seal ensures that no helium makes it into the watch in the first place, avoiding the risk of destroying the watch if the molecules were to expand while resurfacing. 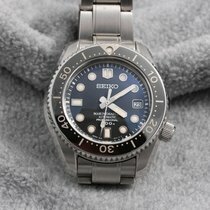 Many of Seiko's standards were added to the ISO standards for diving watches in 1996, which shows how influential the Japanese manufacturer is in this area. The heart of the SBGH255 is the automatic high-speed Hi-Beat 9S85 caliber. It vibrates at 36,000 half oscillations per second (5 Hz) and provides an accuracy of +5/-3 seconds per day. The movement can also be wound by hand using the crown at 4 o'clock, if necessary. Even the bracelet leaves nothing to be desired. Also made of high intensity titanium, it has a refined sliding mechanism on the clasp. This allows the length of the bracelet to easily be adjusted to meet the wearer's needs. If this Grand Seiko has piqued your interest, be prepared to spend around 7,000 euros for a model in mint condition. The variant with the reference number SBGH257 has a blue dial and an additional blue silicone strap. This edition is limited to 500 pieces and costs about 10,000 euros. Despite them being less imposing, it is also worth taking a look at the Grand Seiko diving watches with Spring Drive calibers . The caliber 9R65 with Spring Drive technology runs in these watches and deviates only +/- 1 second per day. The movement is protected by a case made of either stainless steel (SBGA029) or high intensity titanium (SBGA031). With a diameter of 44.2 mm and a height of 14 mm, these watches are a bit smaller than their bigger siblings. They are also only water resistant to 200 m. If you might be interested in buying a Grand Seiko Spring Drive Diver's 200m, be sure to set aside between 4,900 and 5,300 euros. As the name already suggests, Seiko's Prospex Marinemaster Professional was made with professional users – such as professional divers in the oil and gas industry – in mind. A double-walled monocoque case of titanium and ceramic in addition to sapphire glass make this watch especially resilient. The hands and indices are covered in LumiBrite for reading in dark waters and the screw-down crown, unidirectional bezel, and special helium seal make these watches the perfect companions for professional divers. The model Prospex Marinemaster Professional 600m SBDX013 features Seiko's innovative Spring Drive caliber 5R66 and boasts a water resistance of up to 600 m. One of these watches costs about 3,100 euros. On the other hand, the Prospex Marinemaster Professional 1000m with the reference number SBDB011 is water resistant to 1000 m and utilizes the automatic caliber 8L35. Plan to spend around 2,600 euros for one of these watches. Seiko has also thought of recreational divers when making their diving watches. One example is the Prospex Automatic Diver's SRP639K1, which has everything a scuba diver could ever need. It is waterproof to 200 m, has a unidirectional bezel made of titanium carbide, and three hands coated in LumiBrite that will keep ticking for 41 hours thanks to the automatic caliber 4R36. You can buy this watch, also known as the "Tuna" by fans, for around 365 euros. The solar caliber V147 ticks away inside the stainless steel case of the Prospex Diver Scuba 2017 Limited Edition SBDN045, which is water resistant to 200 m. This watch draws its energy from light, making it perfect for people who spend a lot of time outdoors. The Japanese manufacturer also fitted this watch with a screw-down crown and a unidirectional bezel. Limited to a run of 5,000 pieces, this watch is available at around 350 euros. 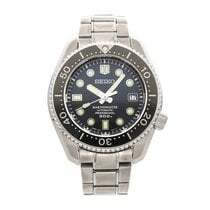 Seiko also has an entire line of diving watches that can be worn with formal wear. One example is the Prospex Automatic Diver's SBDC029 from the Prospex Master Series. At first glance, it could be mistaken for a Rolex Submariner. However, unlike the Swiss cult watch, this Seiko watch is a real bargain. An SBDC029 in mint condition costs around 1,200 euros. Another classic watch is the sizeable Prospex "Turtle." The model with the reference number SRP787K1 and its siblings were given this name by Seiko fans due to the turtle-like shape of their cases. The crown of the new edition is located at 4 o'clock similar to Seiko watches from the 1960s. A modern "Turtle," such as the Prospex Automatic Diver's Special Edition PADI (Professional Association of Diving Instructors) SRPA21K1, can be purchased starting at 320 euros.